Under the Cats Whiskers brandname, there has been seven branches that has been opened. Stragetic planning and decision has resulted in the decommissioning of three branches (Hartamas, Subang and Damansara Utama) while they concentrated on the existing four (Desa Park City, Damansara Perdana, Kota Damansara and Bangsar) boutiques. The last boutique that was opened was at Desa Park City. Almost a year since DPC opened. 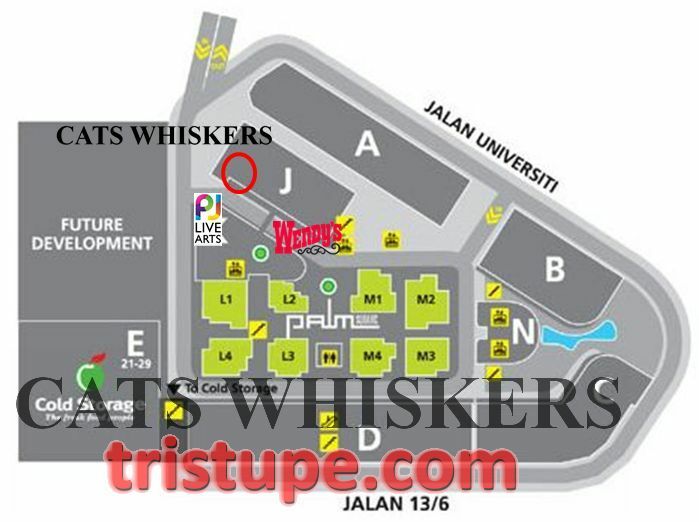 Yesterday evening saw the opening of another new Cats Whiskers branch in Malaysia. Operation wise, this is the current fifth branch and historically, this made it as the 8th branch that was opened. Cats Whiskers has been in business for the past 12 years. They were amongst the first few that has paved the boutique to be situated on the 1st floor of a commercial building (shoplot) when no one believes in going higher than ground floor for shopping. Things has not changed much since and carrying with the tradition (except for the outlet in Kota Damansara), the new outlet is situated at 1st floor of Jaya One. If you are familiar with Jaya One, Cats Whiskers is located in the same building as the Wendy's fast food and directly opposite the PJ Live Arts building. One can either take the lift up from Block C or Block J to the first floor and walk crossing the sky bridge from Block C or walk to the end if coming from Block J (Lift 2). Yes, Jaya One can be confusing. I got lost there a couple of times or worse case, parked at Block B when the destination i wanted to be was at Block E.
Cats Whiskers has always been able to provide affordable quality women clothing, shoes, bags and accessories for the women-folks in Klang Valley. With simplistic shop layout that often provides a comfortable and cosy environment, one can spend hours browsing through the items in the outlets. As usual, family and friends attended the boutique opening yesterday at Jaya One. Enjoy some of the photos shared below. Selections. How one would wish their wardrobe is like this eh? Chi Lup made this fantastic cake. So much effort to layer (four) up! Can make individual swiss roll! Shopping and Food. Two evil many can't resist. Brothers. How to believe? one so dark! Right beside a Feng Shui shop. Soon, Cats will offer Feng Shui Fashion! Pretty Babes all in a row! Team Pokari did it again! Head over to Cats Whiskers online store for an online shopping experience or to their Blogpage for updates. As an opening special, Cats Whiskers is giving a 20% discount if you print out the voucher below to their Jaya One shop. Head on over soon and see you all there!